 Spare Wheel For Trol2/3S (With Brake)Also fits fully welded trolleys.. 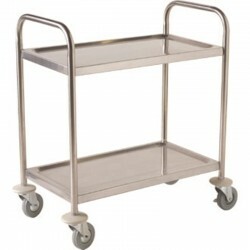 Fully Welded Stainless Steel Trolley - 2 Shelves93 (L) x 53.5 (W) x 83.5 (H)cm; Approx. 56.5cm betw.. 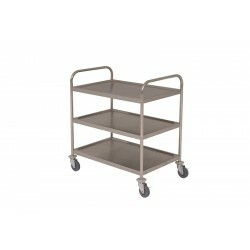 Fully Welded Stainless Steel Trolley - 3 Shelves93 (H) x 53.5 (W) x 85 (L) cm; Approx. 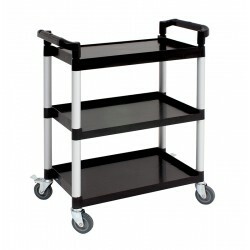 27cm between..
Genware Large 3 Tier PP Trolley Black Shelves107.5 (L) x 49.5 (W) x 97.5 (H) cm; Approx. 30.5cm betw.. 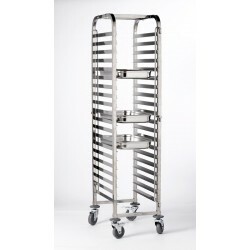 Stainless Steel Gastronorm FULL SIZE Trolley 20 Shelves58.5 (L) x 45.5 (W) x 170 (H) cm; 6.7cm gap..